FROM ACROSS ONTARIO IN YOUR COMMUNITY? The Indigenous Performing Arts Alliance (IPAA) is coming toDefinitelySuperior ArtGallery in partnership with NEECHEE STUDIO! – IPAA wants to create a simple process for Indigenous communities, organizations and groups to host Indigenous artists in local venues and spaces. There is a potential for new funding from Canadian Heritage to pay for Indigenous performances in Indigenous spaces. 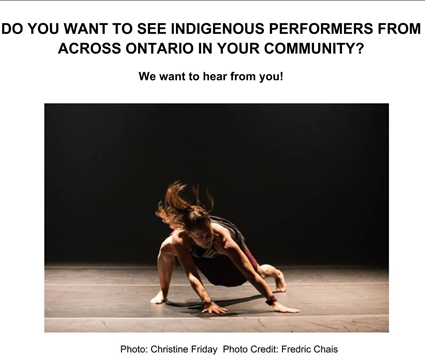 -Join us to discuss the ways to develop a network for Indigenous performing arts presentation in your community. We want to hear from anyone interested in presenting an event, and from artists interested in touring their own performance work to other communities! All are welcome. Hosted by Kerry Swanson and Laura Montgomery, Co-hosted by Neechee Studio and Definitely Superior Art Gallery. Let’s talk about how we can work together to showcase Indigenous artists in our communities. Refreshments will be provided.